At the end of the Avengers: Age of Ultron there is that end credits scene where Thanos picks up the infinity gauntlet and walks off. Where did he get this? We all know that this will lead to him putting the stones into the gauntlet but the gauntlet is protected in Odin's treasure room is it not? In the first Thor film when the frost giants try to steal that frost cube thingy, only to get incinerated, we can see the infinity gauntlet as a treasure piece in a brief shot. Is there something I missed from any of the other Marvel movies that explain how he came to be in possession of this? That means Thanos doesn't have to grab the Glove from Asgard at all. But in Thor: Ragnarok, Hela made it clear that it was a fake Gauntlet. And that there is only one real Gauntlet. Now first of all, I am not a comics expert and this answer might just be speculation, I do think however that we can't expect much more than that at the current state, seeing how this is a mere post-credit scene for the most recent MCU movie. That being said, to my knowledge (which only lacks the 2nd season of Agents of S.H.I.E.L.D.) there was not really any scene in a previous movie that directly explains how Thanos could get his hands on the gautlet. However, during Thor: The Dark World there is a scene where Thor stands in front of Odin and after Thor left it is revealed that Loki, whom we (and Thor) believed to have died in Svartalfheim, is actually very much alive and has taken Odin's place as king of Asgard. Now this as well was just a small scene without much elaboration, so we don't actually know what happened thereafter, how long Loki kept playing king or what actually happened to Odin. But it might be very much possible, that Loki is still playing king of Asgard and making evil schemes. Add to this that Age of Ultron, particularly Thor's worst fear arc, suggests that there's possibly something awry (or becoming awry) in Asgard. While this was just a fear implanted by Scarlet Witch, there might very well be some truth to it. And we also know that Loki worked with (or for?) Thanos before, namely in the first Avengers movie. So it might be (even if that is really just a big "might") that Loki, disguised as Odin, gave Thanos access to the Infinity Gauntlet. In Thor: Ragnarok, Hela peruses some of the artifacts in the Asgardian treasure vault. When she comes to the supposed Infinity Gauntlet, she flippantly remarks that it's an obvious fake. She also implies that the nearby Tesseract is real (which we already knew, since it was brought to the vault after the events of the Avengers), thus proving that she has the expertise to accurately assess the authenticity of these artifacts. 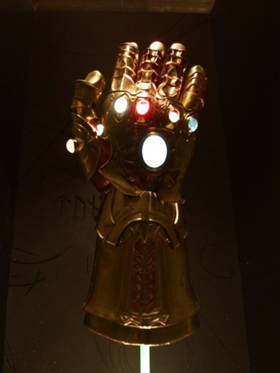 So the gauntlet in the Asgardian treasure vault is a fake, and the real one is in Thanos' possession. Thanos goes to Nidavilir, source of Odin and Thor’s weapons like Mjolnir and such. Etri the dwarf is who designs and builds these weapons. Thanos, in his typical mode of destruction, gives Etri an ultimatum to face his wrath or build him a weapon capable of wielding all the Infinity Stones. The post credit scene in Age of Ultron is showing Thanos taking possession of that gauntlet. We don’t get to see the action immediately before and after that specific action but is later described by Etri when Thor goes to Nidavilir to create a new Thanos busting weapon. Not the answer you're looking for? Browse other questions tagged plot-explanation marvel-cinematic-universe avengers-age-of-ultron . What is the current position of all Infinity stones in the Marvel Cinematic Universe? How and Why are the Avengers already assembled at the beginning of Age of Ultron?